“Who” and “whom” are relativizers, words that either give extra information about a noun or categorize a noun. This blog already has a few lessons on relativizers. A lot of students find it especially hard to use the relativizers “who” and “whom” correctly. Recently, one of my students asked me if I could explain “who” and “whom” a little more in-depth here on the blog. Who/whom follow somewhat different rules when they are used in statements and when they appear in questions. This post will focus on the use of these two relativizers in statements. Below is a chart of the statement rules for who/whom. 1) Write two FORMAL SENTENCES where “who” is used as the subject of a sentence or clause. 2) Write two FORMAL SENTENCES where “whom” is used as the object of the verb. 3) Write two INFORMAL SENTENCES where “who” is the object of the verb. 4) Write one FORMAL SENTENCE where “who” is the subject of a sentence or clause, and “whom” is the object of the verb. 5) Write one FORMAL SENTENCE where “whom” is used as the object of a preposition and as the object of a verb. 6) Write one INFORMAL SENTENCE where “who” is used as the object of a verb and also as the subject of a sentence or clause. 7) Write one INFORMAL SENTENCE where “who” is the subject of a sentence or clause, and “whom” is the object of a preposition. 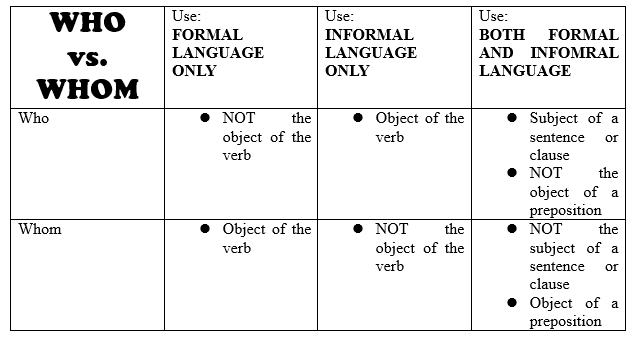 Doing your own sentences in the activities above can really help you master the use of “who” and “whom” in English. But if you’re pressed for time, just carefully read the chart and the example sentences above. You’ll find everything you need to know about “who”” and “whom” in statements. In my next post on this subject, we’ll look at the way “who” and “whom” work in questions.